WEST HOLLYWOOD, Calif. — When Quincy Jones was a child growing up in Chicago and Seattle, he wanted to be a gangster. Instead, he settled for being one of the most influential and accomplished persons in the arts entertainment industry. Jones—the famed record producer, conductor, arranger, film composer, television producer and trumpeter—was honored Tuesday, not for his five decades of spectacular accomplishments, but for his commitment to develop the talent of young musicians as well as preserving and maintaining the heritage of African-American music. This includes working with or contributing to The National Black Arts Festival, the Quincy Jones Listen Up Foundation and the Jazz Foundation of America. The 79-year-old legend received the Montblanc de la Culture Arts Patronage Award during an outside reception at the garden of Chateau Marmont on a clear, crisp night with some of Hollywood’s best-known names, including Sir Sidney Poitier, Morgan Freeman, Terri Hatcher, Billy Zane and Jones’ daughter Rashida Jones. The luxury brand based in Hamburg has a long history of supporting arts and culture throughout the world. 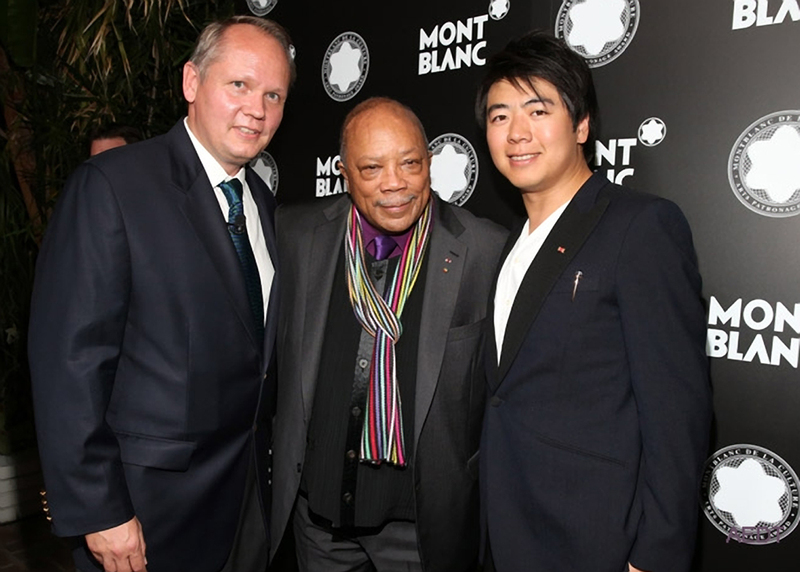 Jones received a $20,000 award, which he will donate to the Jazz Foundation of America and a special edition Montblanc Patron of the Art Limited Edition 2012 Joseph II writing instrument. Joseph II, Holy roman Emperor from 1765 to 1790, created scholarships for talented poor students and was also a great supporter of Wolfgang Mozart. Jones, a Chicago native, after accepting the award, told the story of how his father worked as a carpenter for the “Jones Gang,” a notorious African-American gangster organization that was eventually taken down by Al Capone. The young Jones and his family found themselves on a Trailways bus headed for Seattle. He wanted to emulate the gang members he saw all the time. At the age of 11, the “baby gangster” and his “gang” broke into an armory building in Seattle that served as a recreation center where they ate the ice cream and lemon meringue pie. Then they started raiding the offices inside the building. It became a life-altering moment. Jones’ longtime friends, Poitier and Freeman, both as well known for their eloquent speaking voices as for their accomplished acting careers, spoke on his behalf. Rasheeda Jones provided her unique insight when introducing him for the award. This award is given each year to individuals in 12 countries who have a long history of giving their time and their talents to supporting the arts and art projects. Jan-Patrick Schmitz, Montblanc North America CEO and president, stressed in an interview earlier in the day that the award is for people who have made a difference in the lives of others through arts and culture.